Have Your Progams Handy On A USB Stick! Did it happen to you? You are not at home or in your office and you need a specific file or information right now? Or you would like to burn a CD but there is no burning program on that specific computer? This is where portableapps.com comes handy. 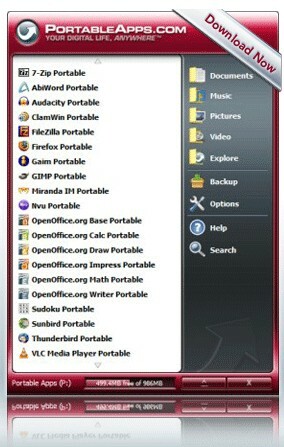 You can either search for hours on the internet to find the best portable programs to put them on your USB stick or you just download the suite on portableapps.com. There are almost every portable program you can think of and the suite get’s updated with the newest program versions very often. If you know some additional portable programs, please let everybody know and leave a link to the program in the comment field. Hey Remaras,thanks for commenting and sorry that this post is too common to other posts. But it would be interesting what you would like to see in this kind of post. If possible I will write another post about programs on a USB stick in the near future which won’t be as common as all the others. Let me know. Excellent solution for jump drives and more functional than the others i’ve used! Glad you found on my blog a better solution. Wow, thanks for this article. Even though it’s from 2008, portable apps and bootable USB drives are completely new to this newbie As a traveling freelancer, portability comes in handy. Glad to have this list.